Though best known for aircraft and aerospace technology, Boeing has invested significant time and money in the construction and promotion of its corporate culture. Boeing’s leaders, in keeping with the standard of traditional American social norms, began to promote a workplace culture of a white, heterosexual family model in the 1930s in an attempt to provide a sense of stability for their labor force during a series of enormous political, social, and economic disruptions. For both managers and workers, the construction of a masculine culture solved problems that technological innovation and profit could not. For managers it offered a way to govern employees and check the power of unions. For male employees, it offered a sense of stability that higher wages and the uncertainties of the airline market could not. 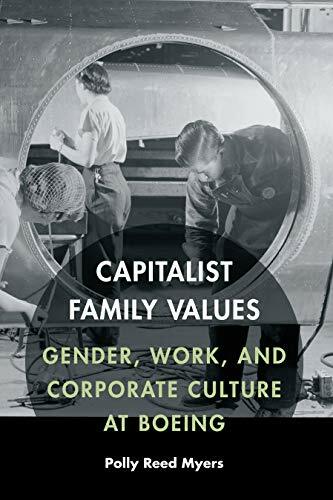 For scholar Polly Reed Myers, Boeing’s corporate culture offers a case study for understanding how labor and the workplace have evolved over the course of the twentieth century and into the present day amid the rise of neoliberal capitalism, globalization, and women’s rights. Capitalist Family Values places the stories of Boeing’s women at the center of the company’s history, illuminating the policy shifts and economic changes, global events and modern controversies that have defined policy and workplace culture at Boeing. Using archival documents that include company newspapers, interviews, and historic court cases, Capitalist Family Values illustrates the changing concepts of corporate culture and the rhetoric of a “workplace family” in connection with economic, political, and social changes, providing insight into the operations of one of America’s most powerful and influential firms.